Welcome to The Merrick Group, Inc.
With more than 25 years experience in the high-pressure waterjetting industry, The Merrick Group, Inc. has grown to include a number of specialists with vast experience and unparalleled expertise in nuclear plant, industrial and environmental cleaning maintenance. Merrick’s highly trained experts boasts an incredible diversity of skill sets, from engineering, metallurgy and chemistry to pumps, hydraulics, industrial coatings and construction. 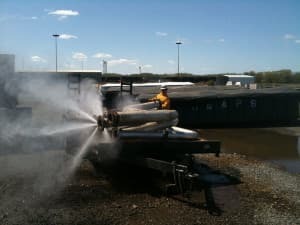 Since 1988, we have pursued a singular goal: to provide customers with timely, specialized ultra high pressure waterblasting, cooling tower maintenance and condenser tube cleaning services while making sure safety remains the foremost priority. Please browse our web site and explore the many advantages of trusting your project to the skilled experts of The Merrick Group, Inc.
Services Provided by The Merrick Group, Inc. The Merrick Group brings to its projects experience, dedication, and a variety of services performed by trained, qualified technicians. Each individual project is carefully set up with safety and quality of work in mind. Several of Merrick’s employees are NACE Coating Inspector Level 1 – Certified. NACE Certification is valued and necessary for many projects within the industry. Satisfied Clients - The Merrick Group, Inc. The Merrick Group has performed services for many clients around the world and in a wide variety of industries. Advantages of The Merrick Group, Inc. Choose The Merrick Group with its proven record of success for all your industrial and environmental cleaning & maintenance services need.